–       there was no place, where the gem could be reliably protected from mothers’ prying eyes. But before you start tapping the wall, looking for a suitable hiding place: The world of today is a bit different than it was in your youth. What formerly used to be the diary is replaced by the customer database of your entrepreneurial life. The pile of love-letters has probably been outstripped by research records, bills and corporate balance sheets. Nothing that would be safe under mattresses or behind loose bricks. concepts can be used. 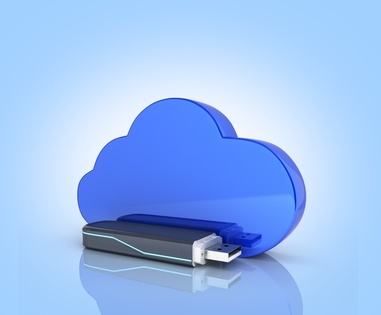 In recent years, the hybrid cloud has emerged for an appropriate model. while other data material is hosted by a service provider. TeamDrive offers not only cloud services, but a free server choice: Data can be stored only on servers hosted by TeamDrive, on own servers, or on the servers of a selected service provider. The TeamDrive security layer provides protection over the company's existing infrastructure. With further security offers, such as end-to-end encryption, zero-knowledge principle and server located in Germany, TeamDrive Systems offers insurmountable security barriers. That’s how confidence in secure cloud computing is growing. 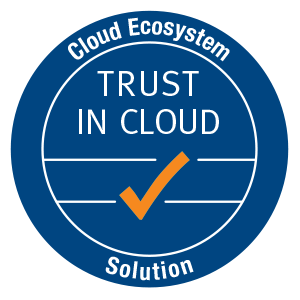 … because cloud computing is a matter of trust. With our new Snapshot feature, called Point in Time Recovery (PiTR), TeamDrive presents a new security solution for cloud computing. In which cases PiTR can be useful? During a ransomware attack company data are encrypted by cyber criminals. Access to the unencrypted data stock is only possible after the payment of a sum X. This can happen to any company at any time. WannaCry gives an impressive example of how fast even millions of companies face this scenario of helplessness. With our Point in Time Recovery there is always a copy of the data on the TeamDrive servers, which can be easily restored in the event of an incident. We also provide additional data security in case of an unintended loss of data such as by mistake or hardware crash. PiTR automatically creates a snapshot of the data stock over all computers connected to the service. 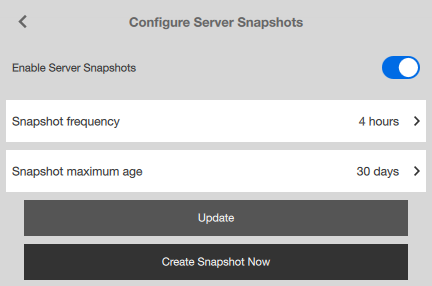 Snapshots are generated every four hours. In the professional version the snapshots can be taken every 30 minutes. If a data loss or a ransomware attack occurs, so that the user can no longer access the data, the data backed up just hours earlier can be restored with a few simple steps. PiTR is kind of a fourth security level in our service. As the three first levels may be considered a complete end-to-end encryption, the zero-knowledge architecture and strict data retention exclusively in German data centers according to national data protection legislation. All TeamDrive customers, using the TeamDrive Cloud storage, benefit from the new security feature, regardless of the client version which they use. The server side snapshots will be automatically created indepentently. Tweaking the solution, changing the pre-defined settings requires the latest TeamDrive 4.5.0 client. 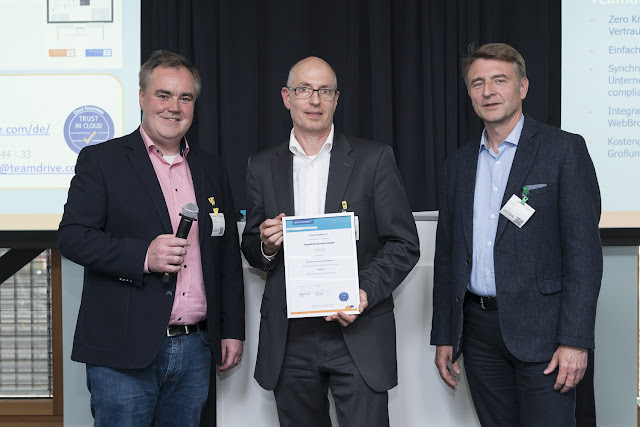 We are delighted to have been presented with the 50th “Trust in Cloud” seal of quality at the Google Cloud Conference in Munich. The seal, which is awarded by the Cloud Ecosystem Association, confirms that our sync & share service adheres to all the cloud-based service guidelines that are of importance to German businesses. These guidelines cover areas such as German data protection legislation, security aspects, service level, contractual arrangements, and other quality criteria that play a crucial role during the selection of cloud solutions in Germany. The seal is important because it helps German companies to make informed decisions when choosing which cloud services to use. Although TeamDrive sync and share services already always store all clients’ data, end to end encrypted, in accordance with Germany’s strict data protection requirements, the seal of quality provides additional confirmation of this from an impartial third party. It underlines that all Data is stored in Data Centers in the EU/Germany. 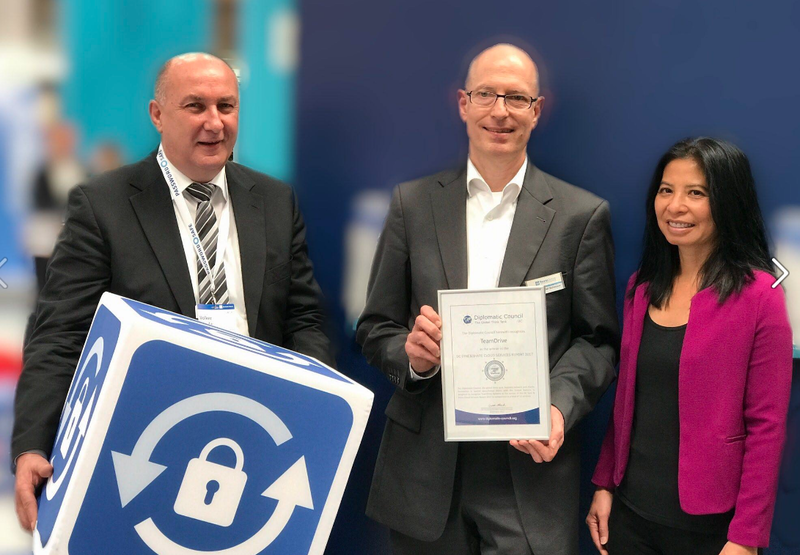 The new seal presented to us at the Google Conference is one of many independent awards we have received in recognition of the features and, above all, the security of our TeamDrive service. The Schleswig-Holstein Independent Center for Privacy Protection (Unabhängiges Landeszentrum für Datenschutz Schleswig-Holstein – ULD) has been certifying our compliance with scrupulous German and European data protection regulations and security standards for years. Moreover, in a comparison of cloud-based sync & share services, the Diplomatic Council, a think tank that provides advisory services to the United Nations, recently confirmed that we offer the best levels of data protection out of the 12 solutions investigated. TeamDrive is the winner of the DC Cloud Sync&Share Services report 2017 of the Diplomatic Council (DC), a global think tank in consultative status with the United Nations. The report was compiled due to a growing demand for an impartial comparison of IT services that offer a secure and reliable means of exchanging data over the internet (the cloud). In particular, the apparent “rampant activities of the intelligence services”, the rise in cybercrime including industrial espionage, and the legal uncertainty surrounding some global data protection regulations have resulted in increasing requests for us to recommend individual services. According to the report, the German-based service TeamDrive is the most secure services. Widely-used alternatives from US suppliers, such as Dropbox, Box, Google Drive or Microsoft One Drive, are expressly not recommended, because, according to the report, they “do not support significant security criteria such as end-to-end encryption, a zero knowledge system and hybrid data storage”. The Global Information Security Forum of the Diplomatic Council classifies these three security characteristics as particularly significant. End-to-end encryption ensures that data is not left unencrypted either during transfers or when stored on the Internet. A zero knowledge system means that even the supplier cannot decrypt the data and therefore cannot read it – not even if required to do so by a court order, for example. Hybrid data storage means that the user can choose the place of storage and apply additional classifications. Redundant storage and unchangeable version control ensure that no data is lost either through technical failures or as a result of attacks via the Internet. The relevant data can always be restored. The think tank’s report describes hybrid data storage as a “crucial criterion for selecting a cloud-based sync & share service”, in order to ensure that, even if data is lost in the cloud, this data still exists. 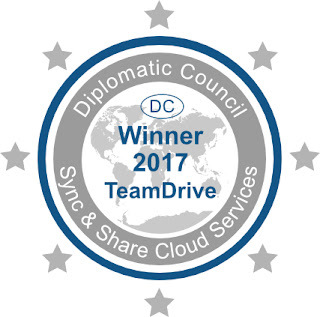 In total, the Diplomatic Council examined twelve cloud-based sync & share services for its investigation: Dropbox, Box, Google Drive, Microsoft One Drive for business, Spider Oak, Syncplicity, TeamDrive, SSP Europe, Telekom MagentaCloud, Strato HiDrive, Ctera Portal and Tresorit. As well as being the most secure services according to the report, TeamDrive and Secure Data Space are also credited by the think tank’s Global Information Security Forum for being the only service to receive the ULD Data Protection Seal of Approval from the Independent State Center for Data Protection. TeamDrive is the only service recommended by the German Lawyers Association (DAV) for professionals with confidentiality obligations, such as attorneys and notaries. In the opinion of the Security Forum of the Diplomatic Council, a service that meets this high standard is also worth recommending for industrial use.